The Boer Goat is originally a South African breed and the best meat goat in the world. Boer Goats were first introduced into Britain in 1987 following several importations from Europe, the British Boer Goat Society was formed soon after. Since then numbers have steadily multiplied into the thriving industry we have today. In the mid 1990’s some Boer Goats were imported from Germany and France. In the following years embryos were imported from New Zealand and live Boers were imported from Canada. Much is owed to those pioneers of the British Boer Goat Society and, following in their footsteps, today many members of the BBGS have imported genetic material in order to widen and strengthen the genetics of the British Boer Goat. The British Boer Goat Society is forward looking along with its’ members and this has meant that the British Boer Goat continues to develop and flourish. Boer goats are the only pedigree breed of meat goats in the UK. 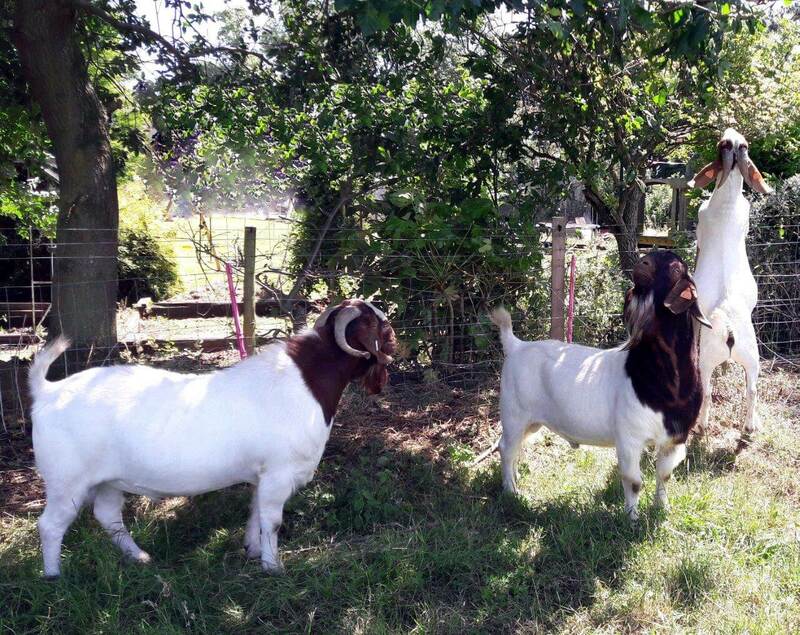 Throughout Europe the British Boer Goat is unrivalled for quality, hardiness and productivity. Good overall conformation, being heavier than other breeds. Well muscled body, having a high dressing percentage. As a breed they are characteristically short-legged stocky animals, that grow quickly and are broad with good muscling. Boer goats can breed virtually all year round. The only time the bucks quieten down and become clean is during April, May and June! This means it is possible for does to be mated and kid 3 times in 2 years, and also means Goat meat can become available all year round and not necessarily be only seasonally available. Boer goats grow quickly but only really reach their full adult weight at 3 years old. Mature bucks can weigh 120-150Kg. Mature does can weigh 80-100Kg. For more information on the Boer goat and all its wonderful attributes follow the link. In appearance it is a goat with a strong head, slight curved nose, round horns bent backward ,a loose, supple and pleated skin (especially in bucks) with different parts well fleshed and in perfect balance. The doe must be feminine, wedging slightly to the front, which is a sign of fertility. The buck, nevertheless, appears heavier in the head, neck and forequarters. The upgraded Boer goat is an animal with symmetry, with a strong vigorous appearance and enough quality. The doe must be feminine and the buck masculine. Please refer to the breed standard for a more in depth overview of the breed . You got the Buck, what's next?